Canoeing Rock Lake in Algonquin Provincial Park in Ontario during the Fall is a stunning world of fascinating colors and peacefulness. In the calm waters of Rock Lake in Algonquin Provincial Park in Ontario, Canada a woman paddling her canoe enjoys the serenity of the area as the arrival of Fall adorns the hillsides. The only movement in the lake is the rings left from the paddle the woman is using to slowly make here way across Rock Lake as the sun glistens off the stunning colors of the forest. 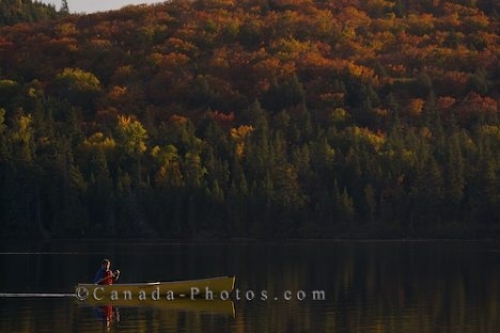 Picture of a woman canoeing on the calm waters of Rock Lake in Algonquin Provincial Park in Ontario surrounded by Fall colors.